What is a .business Domain? Regardless of the size of your company or the industry you belong to, you can use a .business domain name to establish yourself as a professional in your respective sector. The .business domain is a generic top-level domain, or gTLD. It’s an ICANN-certified domain that was made available to the public in 2014. It was first proposed as a welcome addition to the commerce category. However, it ultimately became open to anyone. While other generic domains are catered to suit niche markets, the .business extension has a much farther reach. It’s a versatile name that packs a lot of punch in the eyes of web users and potential customers. Instead of getting lost in the shuffle, set your brand, website, and company apart. As you can imagine, the .business domain has become a popular option for individuals and entities in business-related fields looking to establish an online presence. Tens of thousands of domains have been registered in just a few short years. A lot of these domains were registered for corporate websites and online businesses that are designed to provide more in-depth information about what a company has to offer. The .business extension adds a professional touch that automatically captures attention. It has also been used by e-commerce companies and those with a traditional brick-and-mortar store. The domain’s simplicity makes it easy to remember. It’s also versatile enough to work with businesses big or small. There are many ways to use the .business domain name creatively. One common use for this domain is to differentiate a company’s brand with its overall corporate business dealings. For example, if you own a company that’s focused on producing content or conveying a specific image to your audience, you may want a separate website for corporate operations that go beyond what your customers typically see from you. Having a dedicated website for advertising, sponsorships, or networking can let you take care of the business side of things in a separate digital space. In this instance, you can simply tack the extension onto your business name. A web address like CompanyName.business conveys a sense of professionalism that stands apart from your main brand. Alternatively, you can make the extension a signature part of your company’s identity. The extension is primed for domain hacking techniques. It’s easy to create memorable phrases that you can ultimately incorporate into different areas of your business. For example, you can create a business-related and call it ExcitingStartup.business. 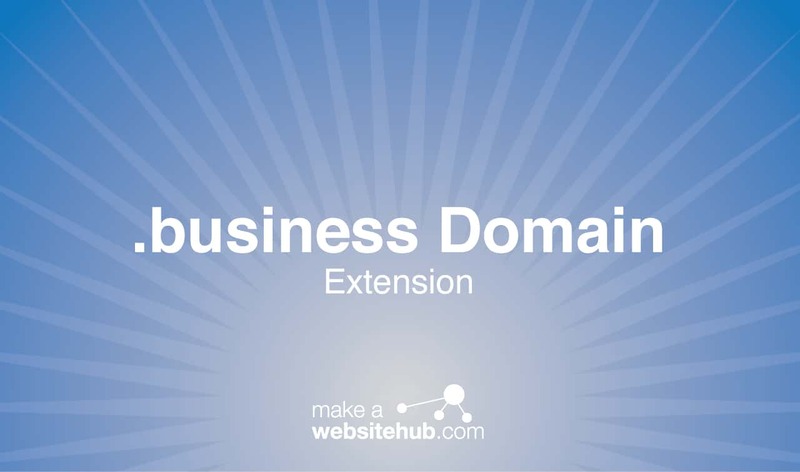 Where Can You Buy a .business Domain Extension? You can check with many popular domain name registrars to see if your desired domain is available. These platforms allow you to search for unused names or browse through options that are available for sale. Here are a few to check out. Currently, there are no use restrictions tied to the .business domain. However, there are some basic naming limitations. Certain organization names are off limits. The same goes for all two-letter domains. However, beyond that, the domain is available to use as you please.